As the search for more new mineral deposits continues, resource and energy industry companies are having to utilise and develop strategies to be competitive and be approved for new projects or expansions in areas with agricultural or biodiversity significance. Mining companies have invested in biodiversity offsets both in Australia and internationally to conform to state or national regulations and in some cases as voluntary actions to maintain their social licence to operate. In New South Wales, despite many mining companies having biodiversity offset projects in place and approved by government regulators, there are concerns coming from environmentalists and community members who feel that these offsets are not achieving the task they are required to do. Also scientists argue that there are still a number of significant challenges that need to be addressed with offset procedures and that it is time for another ‘step-change’ in environmental stewardship. As a response to such developments, in March 2014 the NSW Government released a Draft NSW Biodiversity Offsets Policy for Major Projects, a Draft Framework for Biodiversity Assessment, and a NSW Biodiversity Offsets Fund for Major Projects Discussion Paper. 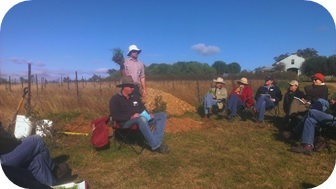 Research in 2014 that responds to these NSW biodiversity offset policy developments has involved: (i) in-depth interviews / discussions with farmers being conducted in the Upper Hunter, NSW on their potential interest regarding involvement in biodiversity offsetting associated with mining; (ii) examination of the ecological restoration needs and potential of Upper Hunter agricultural land sites; (iii) development of a methodology to quantify biodiversity (and potentially socio-economic) benefits. Biodiversity offsets research completed by the team in 2013, to be published soon in the Journal of Environmental Management, vol. 143, is titled ‘Mining and biodiversity offsets: A transparent and science-based approach to measure “no-net-loss” ’ (Virah-Sawmy, Ebeling and Taplin, 2014).